This idea came from a member of the LDS Seminary Teacher Facebook group (seriously, if you are a Seminary Teacher-join that Facebook group). When I figure out who it was, I will edit and post his name so he receives credit for this brilliant visual for teaching “Dispensations” and “Dispensation of the Fullness of Times” using hymn books. 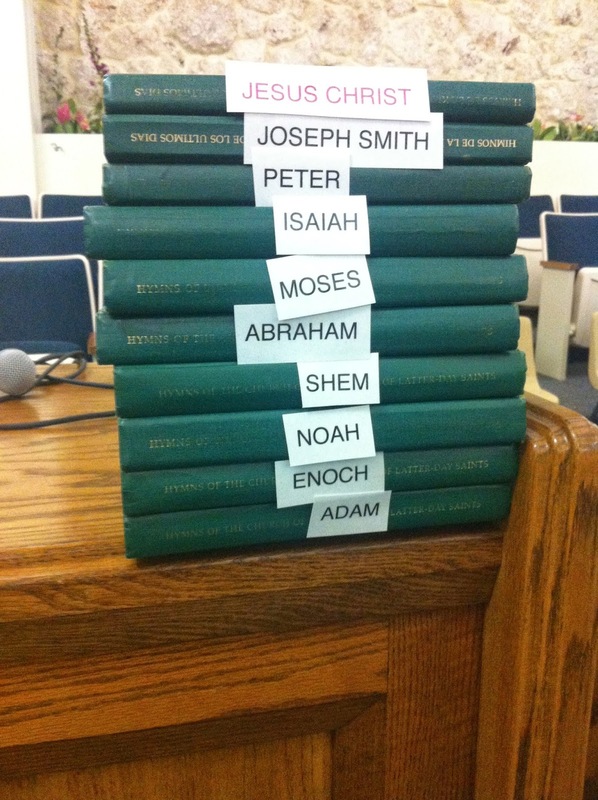 I took it one step further by attaching the names of the Prophets from the different dispensations. I used this when teaching Doctrine and Covenants Section 27. This will work well with Doctrine and Covenants Section 29 and a others regarding Apostasy, Restoration, Prophets, Dispensations, Fullness of Times. If you have a specific suggestion of a Seminary lesson this goes with, please leave a comment below. After we discussed the emblems and symbolism of the Sacrament, we moved to the other side of the chapel to discuss the Sacrament meeting that will be held at Adam-ondi-Ahman prior to the Savior’s second coming. I had the students search Section 27 to tell me who would be at that Sacrament meeting. Stack the dispensations up to show that we are living in the DISPENSATION of the FULLNESS OF TIMES. The dispensation that will usher in the Second Coming of the Savior, Jesus Christ. If I do this again, I may leave a BLANK hymnal in between Peter and Joseph Smith to show the Apostasy. I discussed this verbally, but a blank would have been a more effective visual. I have understood this concept for most of my adult life, but when I taught with this visual, it gave me clarity and understanding in a way I have never had. Source:: Seminary at Six AM – Shauna H.